How to access AWS services from a browser script using Amazon Cognito Identity. How to turn text into synthesized speech using Amazon Polly. How to use a presigner object to create a presigned URL. Amazon Polly is a cloud service that converts text into lifelike speech. You can use Amazon Polly to develop applications that increase engagement and accessibility. Amazon Polly supports multiple languages and includes a variety of lifelike voices. For more information about Amazon Polly, see the Amazon Polly Developer Guide. Playback of the synthesized speech in this example depends on running in a browser that supports HTML 5 audio. In this exercise, you create and use an Amazon Cognito identity pool to provide unauthenticated access to your browser script for the Amazon Polly service. Creating an identity pool also creates two IAM roles, one to support users authenticated by an identity provider and the other to support unauthenticated guest users. In this exercise, we will only work with the unauthenticated user role to keep the task focused. You can integrate support for an identity provider and authenticated users later. Sign in to the AWS Management Console and open the Amazon Cognito console at https://console.aws.amazon.com/cognito/. Choose Manage Identity Pools on the console opening page. On the next page, choose Create new identity pool. If there are no other identity pools, the Amazon Cognito console will skip this page and open the next page instead. In the Getting started wizard, type a name for your identity pool in Identity pool name. Choose Enable access to unauthenticated identities. On the next page, choose View Details to see the names of the two IAM roles created for your identity pool. Make a note of the name of the role for unauthenticated identities. You need this name to add the required policy for Amazon Polly. After you create your Amazon Cognito identity pool, you're ready to add permissions for Amazon Polly that are needed by your browser script. To enable browser script access to Amazon Polly for speech synthesis, use the unauthenticated IAM role created for your Amazon Cognito identity pool. This requires you to add an IAM policy to the role. For more information on IAM roles, see Creating a Role to Delegate Permissions to an AWS Service in the IAM User Guide. In the navigation panel on the left of the page, choose Roles. In the list of IAM roles, click on the link for the unauthenticated identities role previously created by Amazon Cognito. In the Summary page for this role, choose Attach policies. In the Attach Permissions page for this role, find and then select the check box for AmazonPollyFullAccess. After you create your Amazon Cognito identity pool and add permissions for Amazon Polly to your IAM role for unauthenticated users, you are ready to build the webpage and browser script. For more information on the <audio> element, see section 4.7.11. The audio element in the W3C Recommendation for HTML 5.2. Save the HTML file, naming it polly.html. After you have created the user interface for the application, you're ready to add the browser script code that runs the application. Then add a new <script> element after the SDK entry. You'll add the browser script to this element. Set the AWS Region and credentials for the SDK. Next, create a function named speakText() that will be invoked as an event handler by the button. To synthesize speech with Amazon Polly, you must provide a variety of parameters including the sound format of the output, the sampling rate, the ID of the voice to use, and the text to play back. When you initially create the parameters, set the Text: parameter to an empty string; the Text: parameter will be set to the value you retrieve from the <input> element in the webpage. Amazon Polly returns synthesized speech as an audio stream. The easiest way to play that audio in a browser is to have Amazon Polly make the audio available at a presigned URL you can then set as the src attribute of the <audio> element in the webpage. Create a new AWS.Polly service object. Then create the AWS.Polly.Presigner object you'll use to create the presigned URL from which the synthesized speech audio can be retrieved. You must pass the speech parameters that you defined as well as the AWS.Polly service object that you created to the AWS.Polly.Presigner constructor. After you create the presigner object, call the getSynthesizeSpeechUrl method of that object, passing the speech parameters. If successful, this method returns the URL of the synthesized speech, which you then assign to the <audio> element for playback. To run the sample app, load polly.html into a web browser. This is what the browser presentation should resemble. 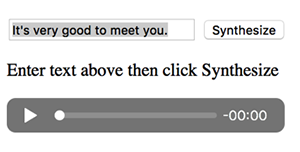 Enter a phrase you want turned to speech in the input box, then choose Synthesize. When the audio is ready to play, a message appears. Use the audio player controls to hear the synthesized speech. Here is the full HTML page with the browser script. It's also available here on GitHub. Experiment with other sound output formats. Add the option to select any of the various voices provided by Amazon Polly. Integrate an identity provider like Facebook or Amazon to use with the authenticated IAM role.